California may be the only state in the country that allows motorcyclists to split lanes, but if bills proposed in Oregon and Washington pass, both states could join their West Coast sibling in helping riders free themselves from the tyranny of traffic. Washington Senate Bill 5623 amends the traffic code to allow riders to lane-split if traffic is moving at 25 MPH or less and only at a speed that's 10 MPH faster than the flow of traffic. The bill was proposed by Senator Tim Sheldon, and has bi-partisan support, with two democrats and four Republicans sponsorship. Oregon, not to be upstaged, has two bills on the docket: SB 172 and SB 420. 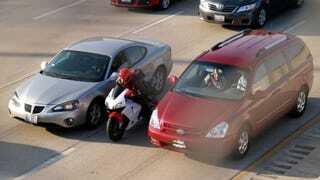 Both laws propose amendments to traffic laws to allow lane-splitting, but one's a bit more conservative than the other. SB 172 only allows riders to filter between cars when traffic is traveling less than 10 MPH and motorcyclists can't exceed 20 MPH. SB 420 bumps those numbers up, allowing riders to split lanes when traffic is traveling less than 25 MPH and caps motorcyclist's speed at 35 MPH. All three laws are slightly more restrained compared to California's non-law, where the CHP recommends riders travel no faster than 10 MPH than traffic and don't filter when speeds are hit 30 MPH and over. Regardless, just the fact these bills have made it this far is a good sign, both for Northwest riders and, of course, motorcycle dealers.